Want to know how I prep for the week in one afternoon? This is how I do it. It is no secret that I am not a fan of the bewitching hours (5 pm to 7:30 pm) at my house. With three young kids, homework to be finished, a house that needs to be picked up, mouths that need to be fed, and dinner that needs to be made—oh.you.know—motherhood/life! By the way, the containers above are EasyLunchboxes. I can’t stress enough that the ONLY reason I am still sane by the end of the night is because I have a good plan for the week and the promise of a bed waiting for me hours later. This weekend, I took pictures of nearly everything so you could see how I food prep for the week. 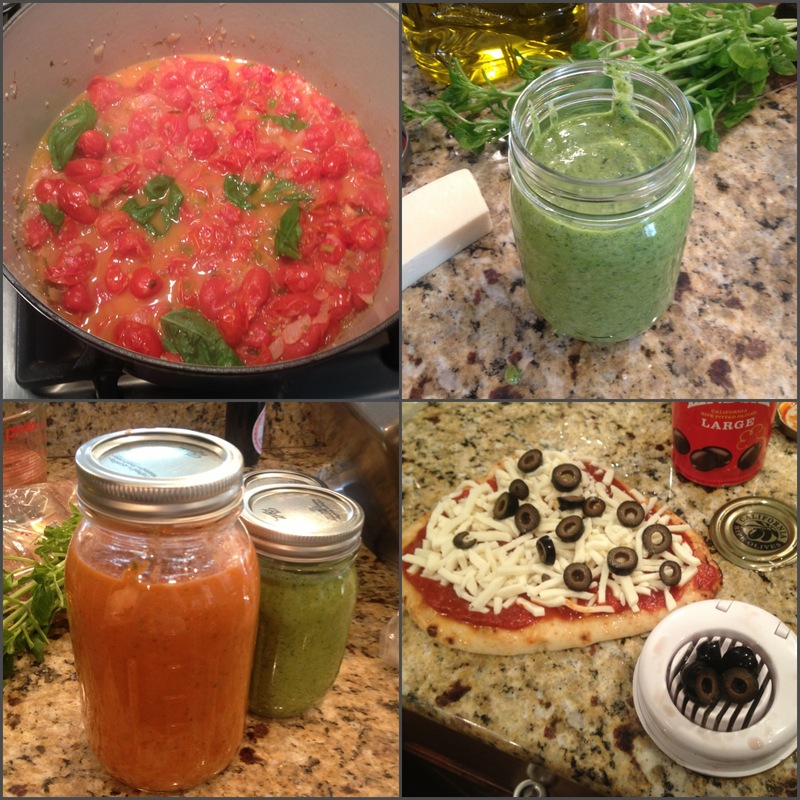 I hope this illustrates how I manage to feed my family homemade food 7 days a week. Here it goes!—pictures and everything!! I know it’s long, but grab a cup of coffee, a glass of wine, or a yummy cookie, and enjoy. 1. I plan around lunch. 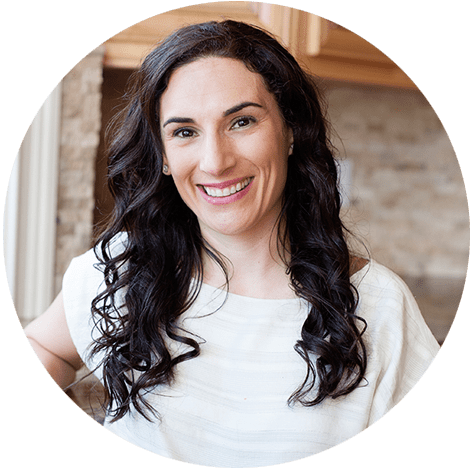 I am about 6 weeks ahead of my subscribers when it comes to the “active plan,” but this way I can see how everything works out for the week and which “make-ahead tips” I insert in our meal plan in addition to those favorite family-size recipes (some are slow cooker too!). Why plan around lunch? This is the one meal where we are away from each other, so packing nutrition and variety is important. I pack five lunches every day: that’s three kids and two adults. We all eat the same thing in different portions, and I make adjustments for our gluten and dairy allergies. Sunday is our “family day.” We have a fun family breakfast (like my easy overnight cinnamon rolls), head to church, and come home. While everyone is eating lunch and the baby is napping, I head to the grocery store (um, groceries), come home, and get started. Just so you know, while I am doing all of this, the kids are playing, bugging me, jumping on the trampoline, and bugging mom some more—they are kids, after all. 3. Wash and prep all fruits and vegetables. I get the kids to do most of the washing and putting away. They play grocery store. Apples, pears, etc. get washed and stashed in the fridge or fruit bowl. Berries get washed and the ripe pineapple gets cut up and stored in a container. Any leftover fruit from last week that was very ripe gets minimally cooked and pureed then packed in a re-usable pouch for an after-school snack. 4. Get your oven busy! Once I turn on the oven, that’s it. Everything gets baked. This week, we are having a breakfast quiche (from leftover deli meats or just a few slices of turkey and ham) plus cheese. I also prepped zucchinis to be roasted the next night (in olive oil and seasoning) and store them directly in an oven-ready dish. 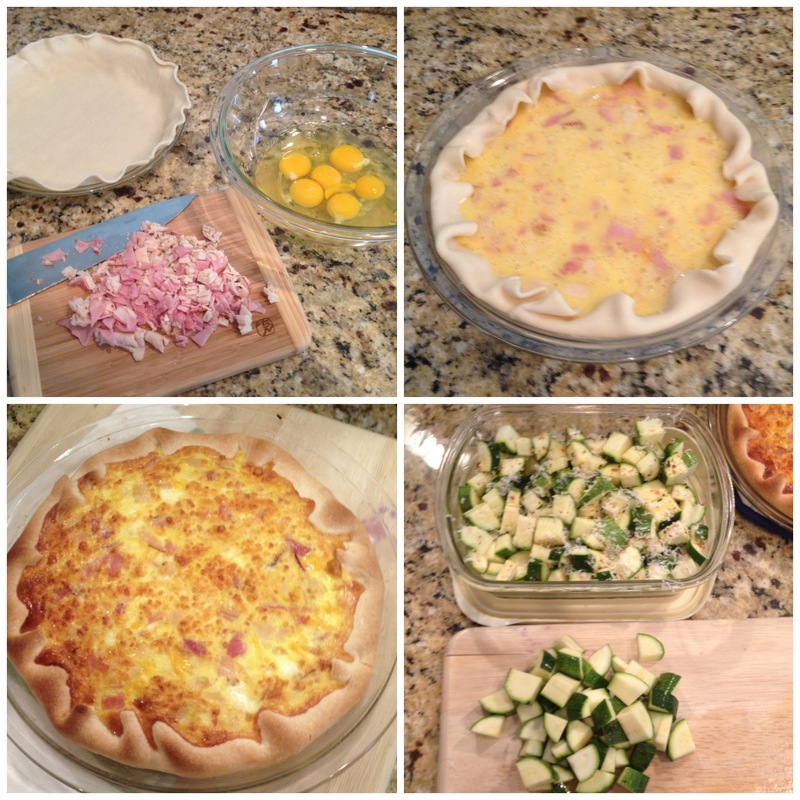 The quiche recipe is in one of our menus. I also bake any cookies or baked goods while the oven is on. There is nothing wrong with cooking rice and pasta a few days ahead of time (like three). My rice cooker cooked the rice, and I boiled pasta. 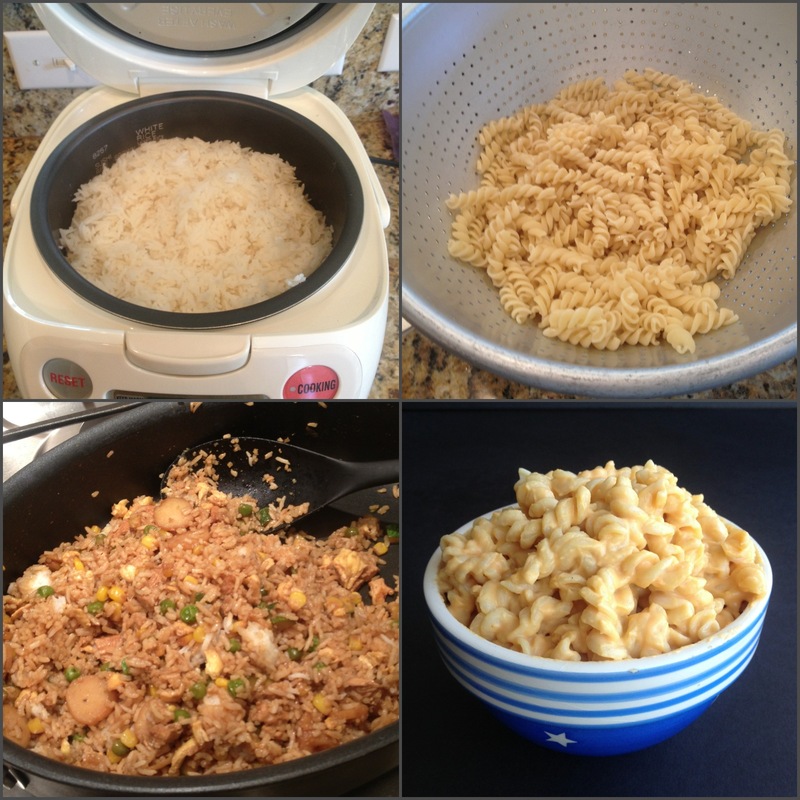 That same night (Sunday night) I made our easy fried rice and made ahead a dairy-free mac and cheese sauce. It was amazing, and my non-vegan/dairy-free kids devoured it. Leftover fried rice is Tuesday’s warm lunch :). Click here to learn how long food keeps hot in a thermos. 6. Make sauces ahead of time. 7. Take care of your proteins. Some weeks, we have bean salads, hummus etc., so I cook my beans in the slow cooker the night before, and they are ready for me for my meal prep-a-thon. 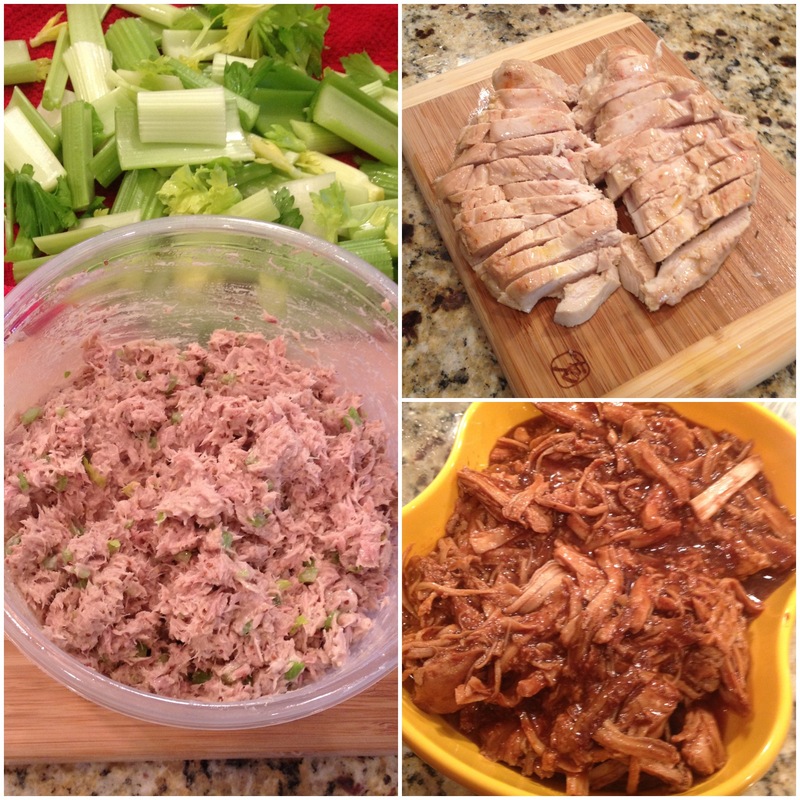 This week, I made tuna salad for lunch (mostly for my husband), grilled 1 pound of chicken, and I’m using our birthday party’s leftover slow-cooked BBQ pork. The other protein we are eating this week is grilled fish so that everything gets made that same night. Oh yeah, the celery gets washed and prepped to fit in our lunch boxes. 8. Pack, label, and refrigerate. What you see here is my fridge. It’s FULL of prepped-ahead items and lunches for Monday to Wednesday. As I take items out Monday morning, there is room for more. Wednesday night, I make Thursday’s and Friday’s. By labeling, I mean I take a dry erase pen and mark anything that needs to be warmed or grilled in the morning. That is a picture of my lunch for tomorrow in an EasyLunchboxes container. “NO WAY I can do that”—yes, you can. All you need is a little planning and a plan. “I’m not that organized“—I’m not either. Just ask my husband. I use a plan, sit for 10 minutes to add the rest of the meals, and go to the stores. “You’ve got hired help”—yes, if by hired help, you are referring to the MOMables meal plan. You can hire help for $6 or less per month. “I don’t have that much time”—I spend about 4 hours every Sunday getting organized for the week. If I don’t, it’s chaos, we eat the same routine foods, and I feel like I just don’t have it together by mid-week. “This is overwhelming”—I’m sure it is, but not so much if you have a plan you can implement. 5 pm to 7:30 pm every night is overwhelming enough for me. “I don’t have the right containers“—Check out all the containers I have here. “I just sorta wing it”—I used to, too. Now, I can feed all five of us for $150 per week for 7 days/3+ meals per day (we may eat out once a month—if that). You can check out how I feed my family on a budget here. Winging it means wasting a lot more than $6 per month on food—guaranteed. I know this was a “long one,” but at least you get to see exactly how I do it. It’s work, but the feeling I get when I finally close my fridge and my kitchen is cleaned is priceless. Hi Martie, The short answer is that we plan for thousands and in many of our plans, it’s really easy to substitute the beef with ground turkey, pork with chicken, etc. We look forward to helping you plan each week. Thank you. I read through this post a while back and started to do the Sunday preparation. It does make sense but I would really love to see the meal plan for that particular week that you write about. I find by Wednesday I need another couple of hours in the kitchen to get the food ready for Thursday and Friday so would love to see where I am going wrong…. or how I could tweak it. I get your food plans and they are great, especially for packed lunches. Barbara, I will add this to one of our video lists. 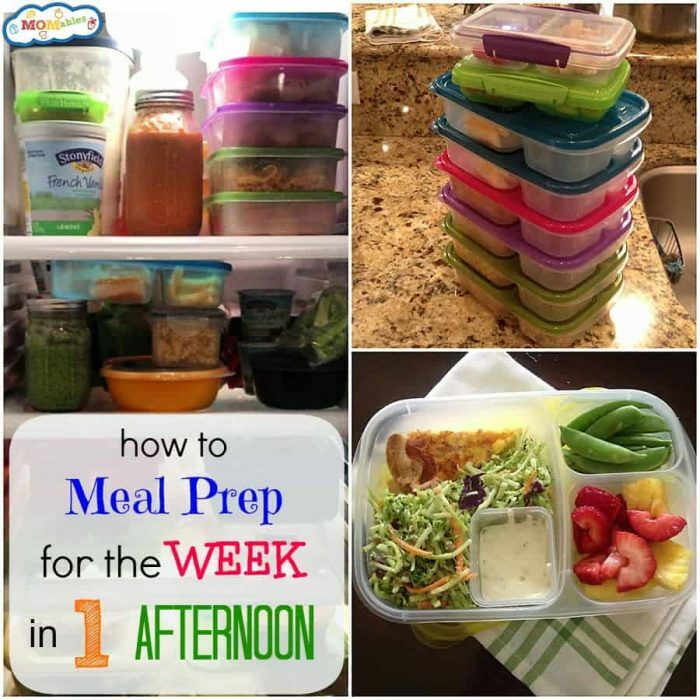 I do this nearly every week with our meal plans plus whatever other meals I add to our schedule. Wednesday nights I replenish lunches for thursday and Friday (most weeks). It will really vary depending on the meals you are prepping for. I am glad it’s helping you save time in the kitchen! 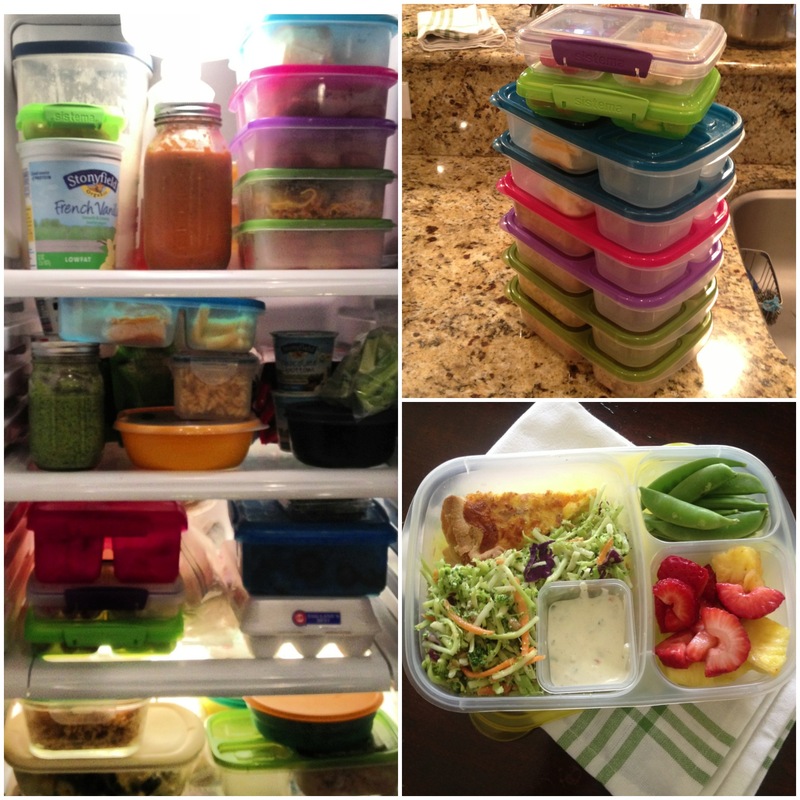 What are the two containers on top of the Easy Lunchboxes? They appear to have some sort of clasp to keep the lid on. those are Sistema containers. You can find them in our store. 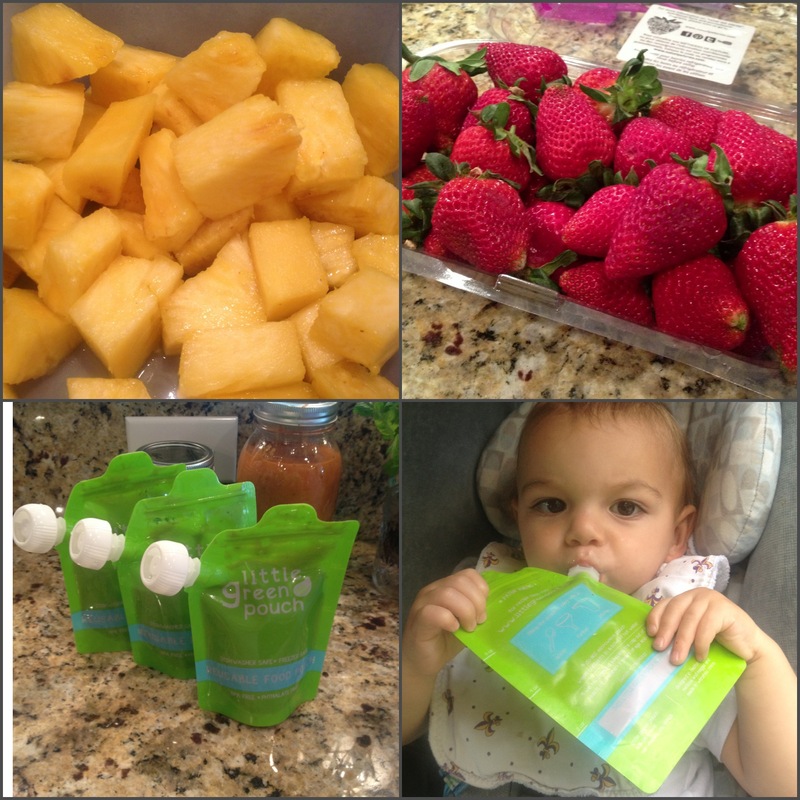 Where do you get your reusable pouches for puréed fruits from? Ashley, head over to our store. We’ve selected the ones we use (sold through Amazon). Wow, I am so impressed and inspired! I need to give this a try, I am very much in “wing-it” mode! Thanks for posting! “Winging-it” doesn’t work for me too well anymore… I pay for it in one way or another. sigh. You mention your kids playing and kind of helping out? Does your husband help in some kind of way to? Does he ever do the grocery shopping while your caring for the kids and prepping or help with the actual prepping on Sunday? Seems like a lot of work for 1 person or is the 4 hour prep time done by both of you? Unfortunately, I know a lot of husbands who sit around watching sports on Sundays while the wife does all the work. How do you motivate your hubby into helping you out? I do the grocery runs 90% of the time while he keeps the kids. He does help, usually with the kids, dong laundry…. all that. It’s 50/50 around here. But I prefer to handle all the food since I am much more efficient. very inspiring! would you mind letting me know what containers you recommend me buying to start with once on your membership plan. Jo, you can check out the EasyLunchboxes here or check out all the other ones I recommend here. Are all of your recipes designed to be eaten cold? How do you organize your grocery lists, plans and order of prepping for the night? Just good old fashion pen and paper? I feel like I would be overwhelmed with the process to just start! Christina, I use our meal plan. What do you do if something comes up on a Sunday and you won’t have the 4 hours to prep for the week? For example needing to go into work or an all day trip with the family? I rarely let stuff come up but if I know it’s coming, I’ll go shopping Saturday night and prep what I can the next day. We’ve gone on a weekend trip recently and I went to the grocery store at 8pm on a Sunday night. I stayed up till 11:30pm. I rather stay up one night late than be unprepared the rest of the week. I looked at the meal plan and was wondering if there is a plan that is for kids with a casein/whey and soy allergy. My son has both allergies and I’m finding it tricky to be interesting when cooking for us all. Catherine, the current plan can be adapted for casein/whey by omitting all dairy items from it. We don’t use soy in our meal plans (unless you purchase ingredients that contain it, but for the most part they are soy free). We will be launching a grain free/soy free menu that is nearly all dairy free this fall. How do you prevent your pasta from getting mushy or too sticky if you prep at least three days before? GF pasta that is. Is there a brand that you have the most success at this with? gluten free pasta is a little trickier. I buy Tinkyada gf pasta. the trick is to under cook it a little… very al dente. Also, rinse it with cool water when you drain it to stop the cooking process. I’ve never had mushy leftover GF pasta unless it was accidentally cooked mushy to begin with. What types of things do you have for dinners? I love the momables lunches but I HATE planning dinners! I agree! 5:30 to bedtime I don’t want to be fussing around prepping! Wendy, please visit our recipe index for ideas. Our meal plan members also receive 3 dinner ideas each week!